in English Language. More details can refer the official website www.bbpsratnagiri.com for BBPS Posts. Interested candidates are send the Updated resume to college Email Address is given below. More details Like Selection Process, Important Dates, Qualification, Salary and e.t.c. Are available given below. 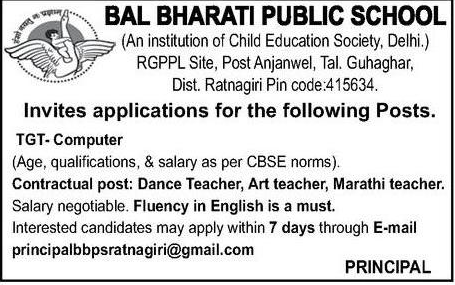 Bal Bharti Public School (BBPS). Eligible candidates are send the Updated resume to college Email Address is given below.